Healthy Homemade Orange Julius is copy-cat version of a childhood favorite. 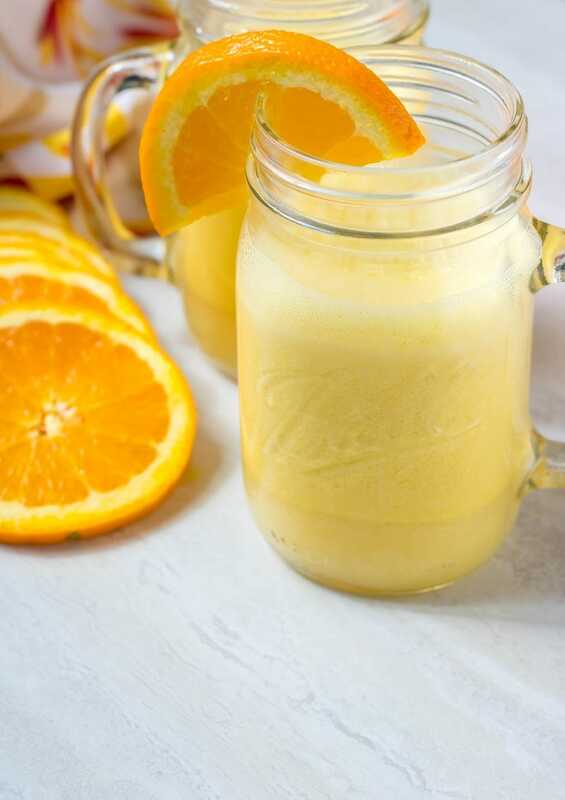 This Easy Orange Julius is made with zero sugars and dairy-free! Directions on how to turn this childhood favorite into a Tipsy Orange Julius Cocktail for adults to enjoy. We were walking through the mall the other day and as my husband began to grow anxious and impatient as I drifted in and out of stores, I heard him mumble that he better get an Orange Julius out of this torture. Torture?!! Okay I will admit, shopping is kind of tortuous for even me–I can NEVER find what I am looking for. Or on the rare chance I do, it doesn’t fit. Story of my life. So I forgave him of his little outburst and he did in fact find a place to get an Orange Julius. When I asked him why they were so good, he looked at me with wide eyes. As if it was a sin to ask such a question. But the truth was, I never opted to get an Orange Julius at the mall. In fact, even though I had heard of Orange Julius’, I didn’t know what they were. Chocolate is my vice. I want to indulge in Chocolate Peanut Butter Milkshakes or Chocolate Covered Strawberry Smoothies, over tropical drinks. What is an Orange Julius? An Orange Julius is a blend of frozen orange juice concentrate, milk, vanilla, sugar, and ice. It’s like a dessert smoothie. And I must admit when I tried a sip of the Orange Julius, it was good and refreshing, but the sugar in that sucker!! WHOA! I knew I had to learn to make one of my husband’s favorites at home, so we could enjoy without the sugar crash. Behold my HEALTHY ORANGE JULIUS. 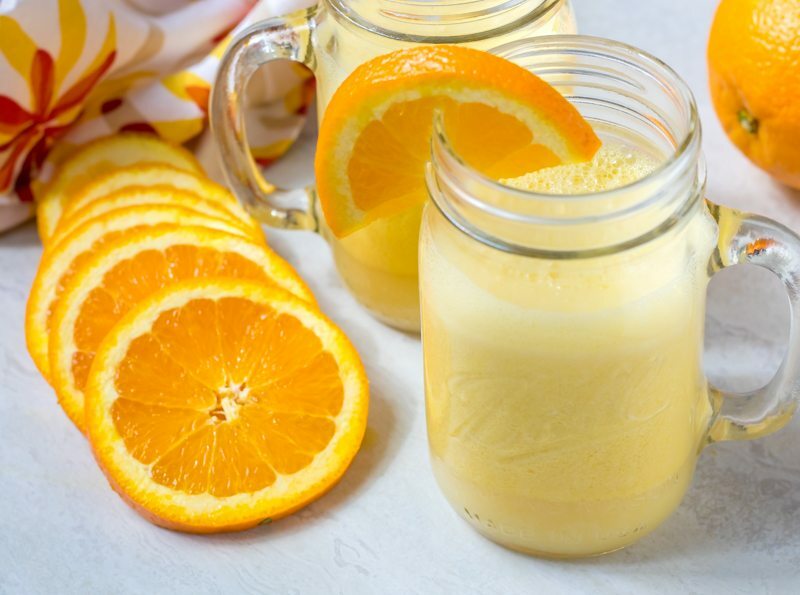 I took out the ALL the added sugars in the original drink to create a healthier take on an Orange Julius, and this recipe could not be any easier! 3 simple ingredients and I made a killer good rendition of the classic. Add in a splash of vanilla vodka and BAM– a TIPSY ORANGE JULIUS. If serving this Orange Julius to adults, I suggest adding some vanilla vodka for a Tipsy Orange Julius Cocktail. I like to use unsweetened vanilla almond milk (that has zero grams of added sugar) in the base of this Orange Julius. Canned Coconut milk is another delicious non-dairy option and is a bit reminiscent of my Pina Colada Recipe. If you are not dairy free, you can use regular milk for this Orange Julius recipe. Be sure to use pulp-free orange juice concentrate for a smoother cocktail. If you use vanilla flavored non-dairy milk, you can omit the vanilla extract. 3 simple, all natural ingredients come together to create a copycat version of a childhood favorite. Place all ingredients (including vodka) into the blender and blend until smooth. Serve immediately. If serving this Orange Julius to adults, I suggest adding some vanilla vodka for a Tipsy Orange Julius Cocktail. You can use up to 6 ounces (1 ounce per serving) I personally only use 1/2 ounce per serving. I like to use unsweetened vanilla almond milk (that has zero grams of added sugar) in the base of this Orange Julius. Canned Coconut milk is another delicious non-dairy option and creates a richer smoothie. Bam indeed!!! Oh my goodness… who knew this could be so easy?? I remember getting these drinks as a kid on Sundays after church, but I haven’t had one in probably 20 years! (They did exist that far back, right??). Love the Tipsy version! You will love this version so much more too! I remember going to the mall as a kid and getting Orange Julius. Thanks for the adult version! You bet! I hope you enjoy it MORE than any one you had at the mall! Oh I love a good Orange Julius. At home, I use frozen bananas to get it creamy and sweet without the added sugar. Concentrate is a great idea! Give this a try Melissa! I also make a smoothie like this with bananas (with OJ, coconut milk as well), but this version is purely orange flavor!! Are these 6 or 8 oz servings? Hi Betsy, these are 8 ounce servings. Enjoy! We add ice cubes to make it frozen and not so much milk. Love the idea of vodka in it! Been making it for 45 years,lol. That is a great idea too Penny! Love that you have been making it for so long.